Evergreen woody climber, native to Europe, the Mediterranean, and West Asia, widely cultivated as an ornamental; leaves alternate, simple, ovate (on creeping and climbing stems) to palmately five-lobed (flowering stems exposed to full sun); flowers yellow. Extracts of leaves are used in bronchial diseases, including spasmodic cough. The extract has expectorant and antispasmodic properties. Higher doses may be irritant to mucosa and skin. Oral administration of hederacoside C to rats results in a low absolute oral bioavailability of 0.118–0.250%. This extremely bioavailabilty may be due to poor absorption from the gastrointestinal tract and/or its decomposition therein. „The effect of ivy leaves dry extract is based on its secretolytical and broncholytical properties. 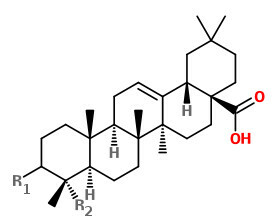 The main active compounds are saponins (Cioacá et al., 1978, Trute et al., 1997 and Bedir et al., 2000), especially α-hederin represents the most important saponin molecule responsible for the therapeutic effect (Sieben et al. 2009). α-Hederin inhibits the internalization of the β2-receptor leading to an increased adrenergic accessibility of the cells. Subsequently, type II alveolar epithelial cells generate more surfactant yielding to the secretolytic activity by reduction of the mucus viscosity. Similarly, the bronchodilating effect can be related to the increased β2-adrenergic activity resulting in a higher sensitivity to spasmolytics such as adrenalin, the strongest physiological bronchodilator (Hegener et al. 2004). In a double blind comparative study against Ambroxol, the ivy leaves dry extract demonstrated non-inferiority concerning relevant clinical and lung function outcome parameters (Meyer-Wegener et al. 1993).